I so wanted to take part in Melanie Muenchinger's challenge to make a card using her just wonderful "A Year of Flowers", as the prize is to win a copy of her new stamp set that is just about to be launched by Gina K Designs (and also a change to be a guest designer on her blog!). I think this also makes a late entry for the challenge over at A Passion for Papertrey too. I knew I wanted to make a Valentine's card and use the roses as they are my favourite in the set, so when I had them all coloured up I hopped over to Mojo Monday blog for some inspiration. 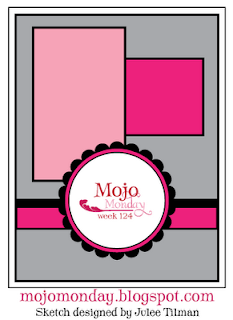 This is for Mojo Monday 124. All the other supplies are by Papertrey and the sentiment is from Heart Prints. Thanks for stopping by and I hope you have had a great weekend! wonderful coloring!! love the layout, thank you for playing! Lovely your roses are beautiful, and I love that text in the background! What a wonderful card! The roses look gorgeous! Great card! I love the roses overlapped like that! Simply gorgeous! I love your roses. I'm actually contacting you re those goodies boxes of PTI....I've come over from the Simplicity blog and can't see any other contact way to get to you. I too just about saw red when she said that too....I actually commented that I was so disappointed that she expects us Europeans to pay big bucks to get her stuff and then she couldn't see her way to pay for one box tocome to us. So glad you felt the same. I said all this very tactfully I might add and the comment was pulled, not surprisingly, they don't want to hear the truth and lets face it their main market is the U.S. ....and yes, I love PTI, don't want all of it but already have 10 sets which I am grateful for. Thankfully now I have a contact who, when ordering for herself will order for me and ship actual charges. I'm also grateful for her kindness. Wish, wish, wish they would do SOMETHING to lighten the load for us...sigh......best regards from Joyce in Northern Ireland who cannot afford exhoribtant shipping. A beautiful card with superb colouring! Thanks so much for entering this over on our PTI blog!